You can Lets you create a numbered sequence over a selection. The sequence can be forward, backward, single, double or higher increment, as a cycle, and so on. The selection can be over one cell or a cell range in one column or more or an entire column or many entire columns. From the top menu, select Animation > Cell > Sequence Fill. In the Timeline view, right-click and select Exposure > Sequence Fill. Press Ctrl + M (Windows/Linux) or ⌘ + M (Mac OS X)). 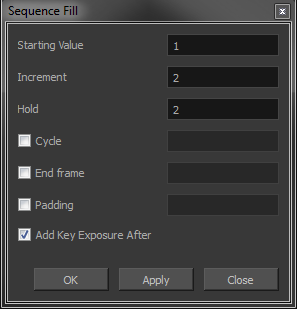 The Sequence Fill dialog box opens. In the Starting Value field, type the first number in the sequence. In the Increment field, type the number by which the drawing number will increase from frame to frame. For example, an increment of 1 gives you: 1-2-3-4; an increment of 2 gives you: 1-3-5-7; and -2 gives you this: 8-6-4-2.